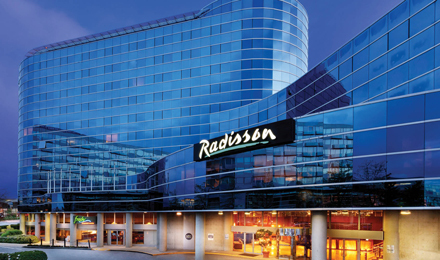 For easy NYC access without the hassle of staying downtown, reserve a modern room or suite at Radisson Hotel New Rochelle, situated off I-95 just north of New York City. Commuting is a breeze thanks to the hotel’s location near the Metro-North Railroad and Amtrak bus station, only a 10-minute walk away, and LaGuardia Airport (LGA), about a 20-minute drive away. Walk about eight minutes to find fun activities at New Roc City, an entertainment and shopping complex near the hotel. Upgrade to a Business Class Room and reward yourself for a job well done with perks like a complimentary breakfast and a drink voucher. Located on site, NoMa Social serves Mediterranean-inspired dishes and tapas in a chic dining room. Pair your meal with a selection from the restaurant’s extensive wine and beer menu, or opt for a signature sangria and a few small-plate appetizers. Later, unwind at the NoMa Social Lounge with music and late-night drinks. New Roc City – Just two blocks away, New Rochelle’s downtown entertainment center features restaurants, shops, a movie theater and an indoor amusement park with rides like the Space Shot. Bronx Zoo – At the Radisson, you’re 11 miles from one of the largest metropolitan zoos in the country. Make your experience at the Bronx Zoo interactive with a camel ride or a visit to the 4-D theater. New York Botanical Garden – Wander through 250 acres blanketed with gorgeous plants. Located nine miles from the hotel, NYBG is a feast for the senses, offering live performances, rotating exhibits and aromatic blooms. Take advantage of our 6,400-square-foot meeting space to host events for up to 250 guests. Our professional staff can help you plan the details of your event and choose the right room, such as our Social Room, which makes an elegant venue for large gatherings. Let our expert chef prepare the perfect menu for your banquet or reception. Watch a movie on your hotel room’s flat-screen TVEach of our 130 rooms and suites at Radisson Hotel New Rochelle includes free Wi-Fi and an in-room refrigerator so you can feel right at home. Enjoy a night in by ordering room service and watching a Disney or TBS movie on the flat-screen TV. You can greet each morning with a cup of freshly brewed coffee before exploring the streets of NYC or other nearby attractions. Need extra space? Upgrade your stay to a One-bedroom Suite, outfitted with a living room that has a sectional sofa and dining table. Relax in a comfortable Standard Guest Room, which comes with all standard amenities and your choice of one king bed or two full beds. For an extra touch, contact the hotel to reserve a guest room with a lovely view of the Long Island Sound. Dine on Mediterranean tapas at our on-site restaurantIndulge in an unforgettable meal at our on-site NoMa Social restaurant at Radisson Hotel New Rochelle. Open for breakfast, lunch and dinner, NoMa Social offers a casual yet elegant atmosphere for enjoying Mediterranean-inspired cuisine. This vibrant space is perfect for sharing a meal with colleagues or sipping wine with a friend at the sleek bar. At NoMa Social Lounge, you can round out a busy day of meetings or sightseeing with happy-hour martinis and after-dinner drinks. Be sure to sample savory hors d'oeuvres while you bask in the ambiance. Dreaming of breakfast in bed or need to work through lunch? Then order something delicious from the light room-service menu.